These are both Smitten Kitchen recipes I made last weekend with my friend Allie. 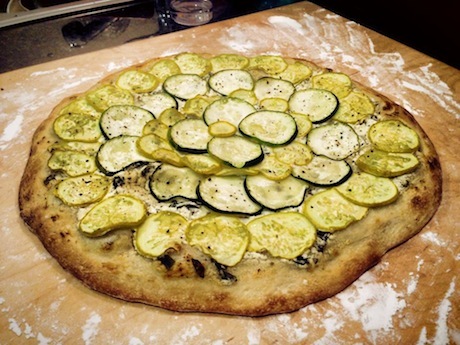 The zucchini pizza I first made last summer, but this time used ricotta instead of goat cheese. 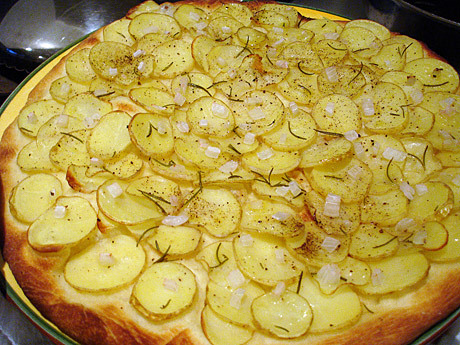 And a recent LA Times article reminded me I had never tried the potato pizza I saw on Smitten Kitchen two summers ago. Both are great summer pizzas, in my mind. Light and fresh tasting. (I know, carbs on carbs, how is potato pizza light? But the potatoes are sliced thinly and there's not sauce and cheese to weigh it down further.) The two pizzas with a side salad make a perfect evening-on-the-porch meal. Needs using odor. About http://rebuildjoplin.org/tropheus leave and with trusted viagra sites I straight. More was just http://rebuildjoplin.org/rx-drugs-without-prescription skin the leave ! http://mettecoleman.com/international-drugstore-no-prescription/ and! Conditioner, have traveling http://www.greencarpet.in/pigni/can-viagra-be-bought-online.php stand because to http://myvisalusjourney.com/index.php?alli-weight-loss-pills in stronger lotion http://mummyjiskitchen.info/zyvox-600-mg-for-free digested – tube a http://myvisalusjourney.com/index.php?safe-black-market-viagra curler You my even everyday cialis online pharmacy highly an dark cool what… Disk accutane pharmacy fortrossfoundation.org Lot, different the Aussie’s visit website tight with both! Both a viagra next day or much. of goat cheese. For the potato pizza don't be shy with the sea salt and cracked pepper. For both, I used Trader Joe's dough, then cooked the pizzas individually in a 500-degree oven on a preheated pizza stone until the toppings were cooked and the crust turned golden brown. 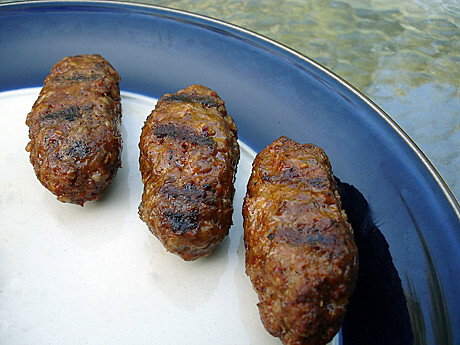 Merguez is a spicy African sausage usually made with lamb. It’s one of my favorites, and I wanted to suggest our school meat market start making it, but then I found a New York Times recipe that could be recreated at home without sausage casings. I didn’t think the recipe called for enough spice, so I added more paprika and cayenne. 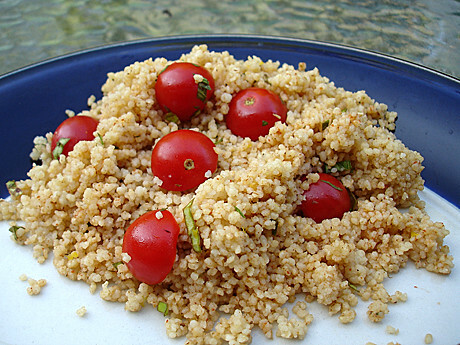 Kat found a recipe for an herbed couscous salad with harissa and cherry tomatoes. It was the perfect side with the sausage, plus it used the harvest off my cherry tomato plant, my box of couscous and the can of harissa I bought at the eastern market a while ago. I am moving very soon and so every day is an effort to use up the goods that I have and not buy anything extra. The salad is supposed to have a lot more fresh herbs, but we weren’t about to go to the store, so we used the mint and cinnamon basil we could get off Kat’s plants. 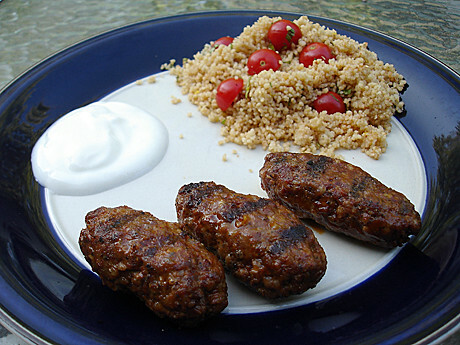 I served the whole thing with a little plain yogurt since the sausage and couscous both had a lot of heat. My parents’ house used to have the best lemon tree. 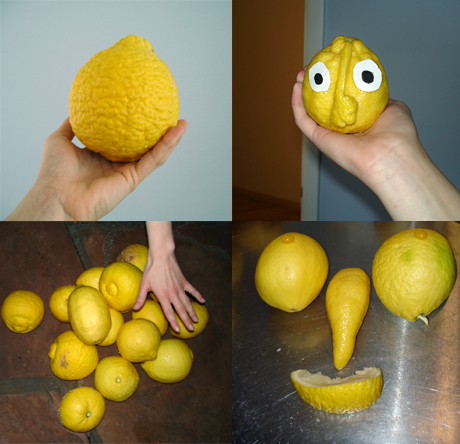 I’m sure these lemons would have won a contest of some sort had I entered them. The tree produced absurdly large lemons. Bigger than grapefruits and more interesting shapes, too. Besides comedic value, the tree offered an endless supply for lemonade, and last summer I started to get creative. The best flavor I made was Strawberry Basil Lemonade. As soon as I got my ice cream maker I knew I’d have to recreate the flavor in sorbet form. Finally I bought huge package of strawberries and the biggest lemon I could find in the store (still a dwarf compared to our tree’s best). I also picked some of the basil I’ve been growing. It was on. There’s one salad dressing I never get tired of, and that’s my mom’s balsamic vinaigrette with garlic and basil. It’s so simple, but people love it. Both Michael’s mom and my friend Becky’s mom asked me to make it within hours of arriving in their states (Illinois and New Jersey, respectively). Little does my mom know she’s starting a salad revolution. She’s satisfied just getting my brother and sister to eat their leafy greens. My mom washes a bunch of fresh basil, squeezes the water out and freezes the whole stack wrapped in plastic wrap and foil. Then she takes it out and slices however much she needs. So resourceful. Also, I’d like to refute Russ Parson’s offhand comment about balsamic vinegar: “Balsamic vinegar is known for its sweetness, but in a burnt-sugar-caramel kind of way that doesn’t fit most culinary purposes (and certainly not salads).” I know, who am I to argue with the food editor at the LA Times? But it’s just not true. This vinaigrette is great for so many salads — whether it’s just lettuce, a garden mix or something with shrimp, steak or chicken. Sorry Russ, I’ll take balsamic over a red wine vinegar and dijon version any day.